You know how when you drive a brand new car it just feels so nice and crisp? It goes over speed bumps smoothly, it drives so straight and true, it feels so responsive, and any steering input is immediate. It’s nice right? 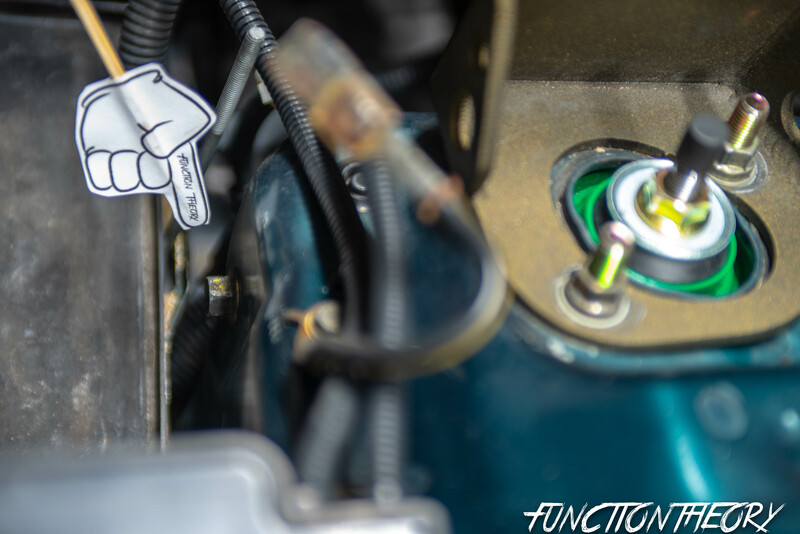 You wish your car could feel this way? Well truth is your car can feel this way. 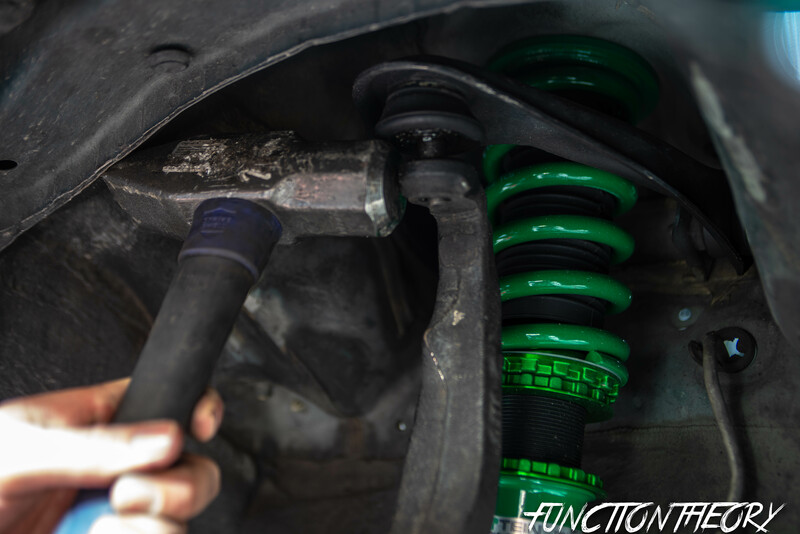 As your car gets older, as the weather and climates of the environment you live in start to take a toll on all the moving parts of your car: shocks, bushings, ball joints, tie rods, etc… All these suspension parts become worn and start to develop “slop” or “slack” in them. 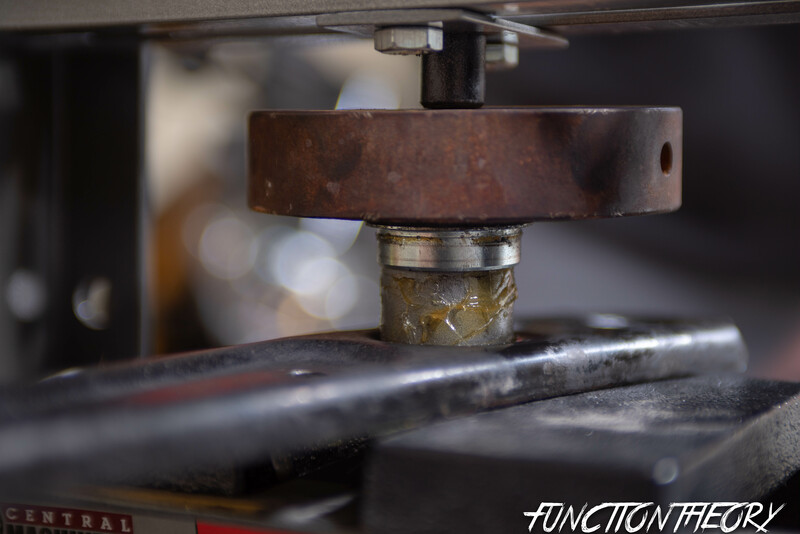 This is what makes your car start to feel loose, wobbly, insecure, dull steering input , and develop a shakes when driving. 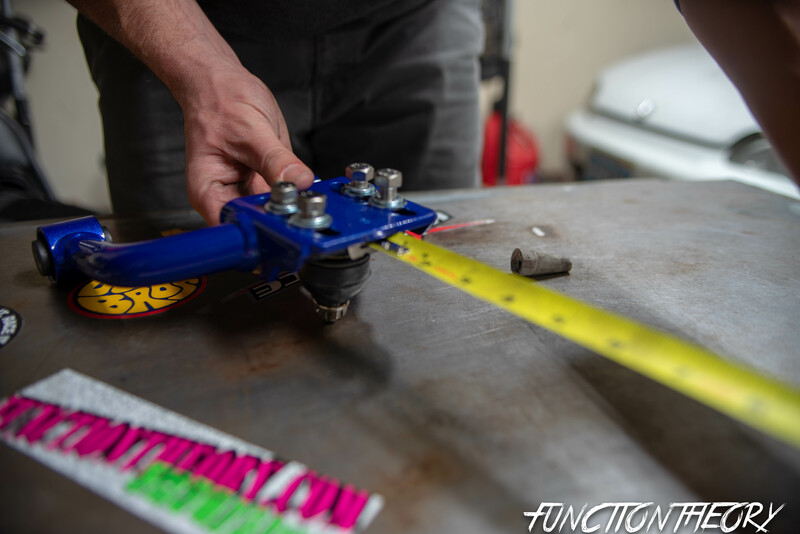 Now when most people “modify” their cars these key components are often overlooked as most people don’t want to spend money on things that don’t appear to be broke. 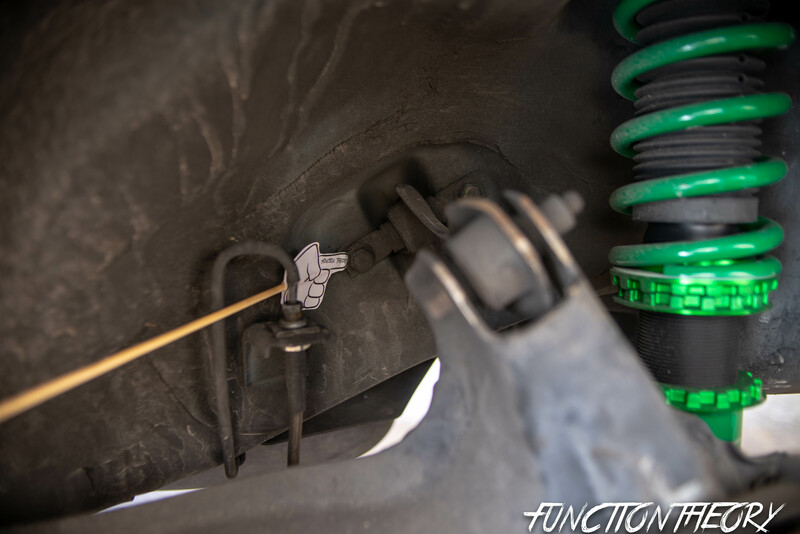 I will be the first to admit that I’m guilty of this, and that I would often neglect these when modifying my car. 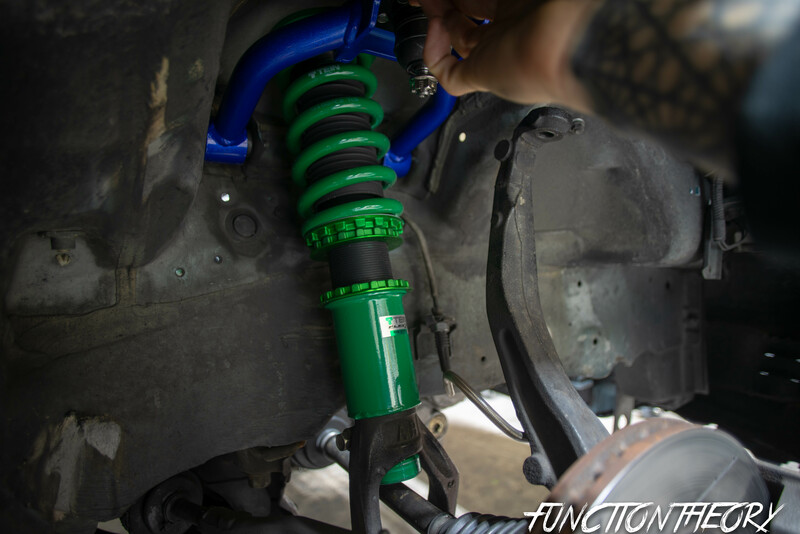 Coilovers, sway bars, roll cage, strut bars, and sub frame braces. This is all you need to make your car handle better!? For the average driver, or person that likes to say they are an enthusiast. 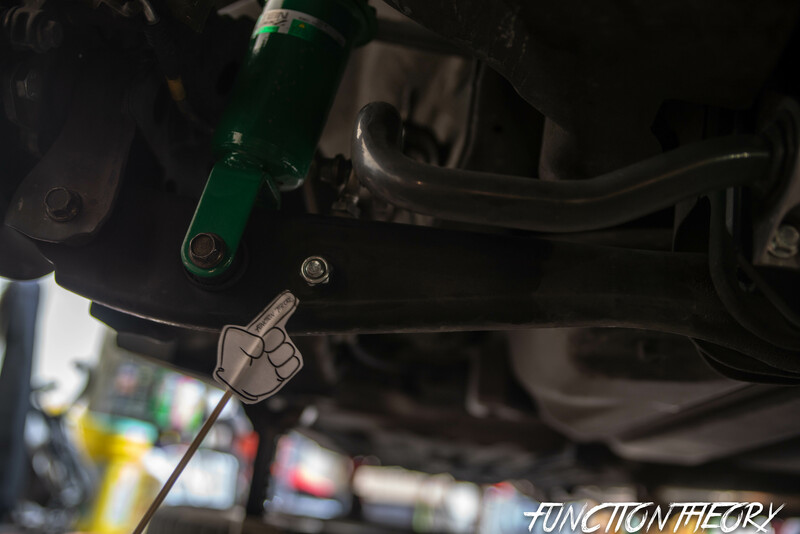 these are the basic modifications that will in fact make your car handle better. For a true enthusiasts, someone that drives there car to the limits everywhere, just doing these things alone won’t suffice. As I learned at my last track day, there was a high speed right (100-110mph) and as I would go through this I could feel my wheel begin to shake, and it always left a small bit of fear in me hurting my confidence to push hard through it for fear of something breaking. 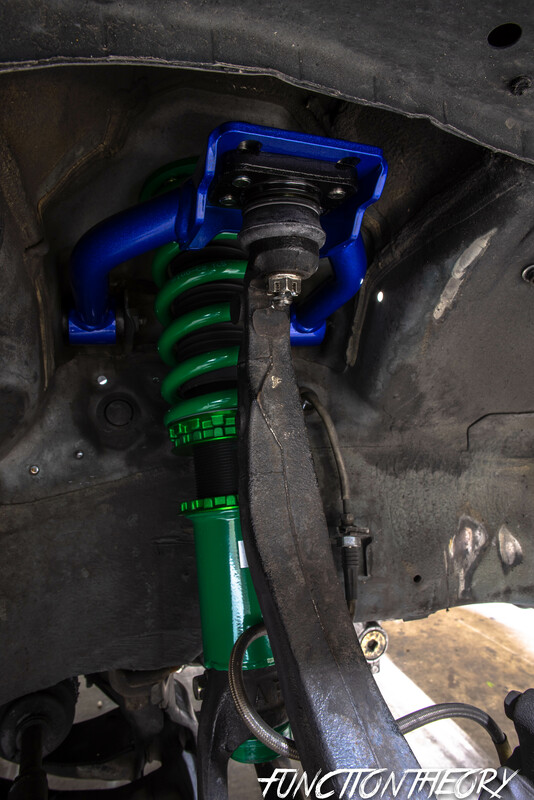 Once back from the track immediately ordered new Hardrace inner tie rods, and hard race outer super tie rod ends. 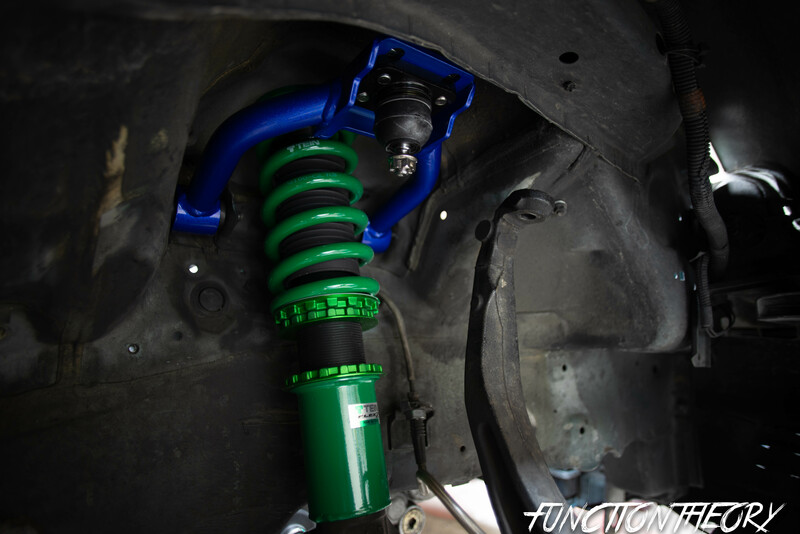 ( since my track car has all good bushings and ball joints ) This instantly solved the problem of that high speed shake. 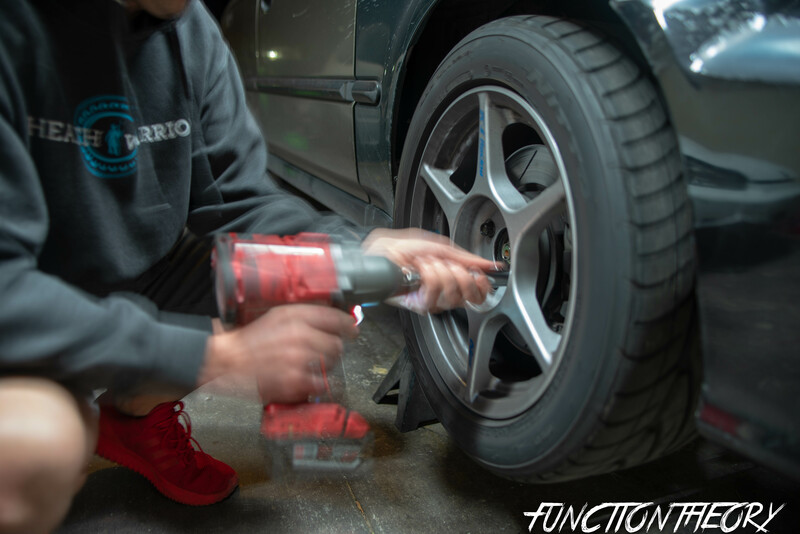 With worn out parts the shakes/wobbles get exacerbated the more extreme the driving condition which is why you may not notice it as much when you are just daily driving your car around. 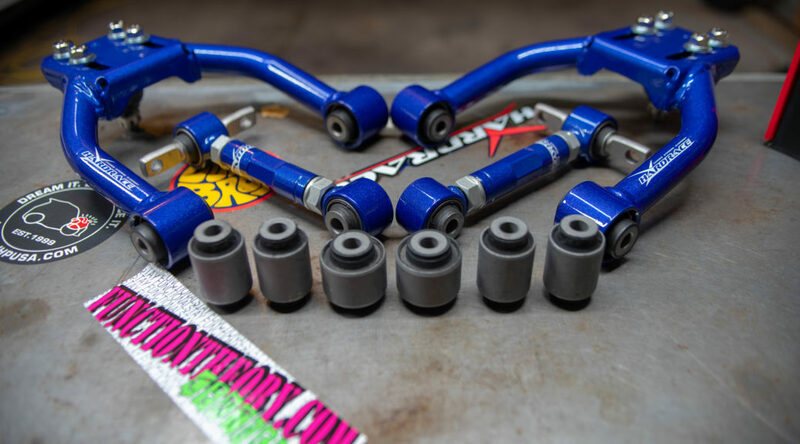 If you replace your bushings and ball joints with just even OEM bushings ( doesn’t even need to be race spec aggressive stuff ) you will instantly notice a difference. 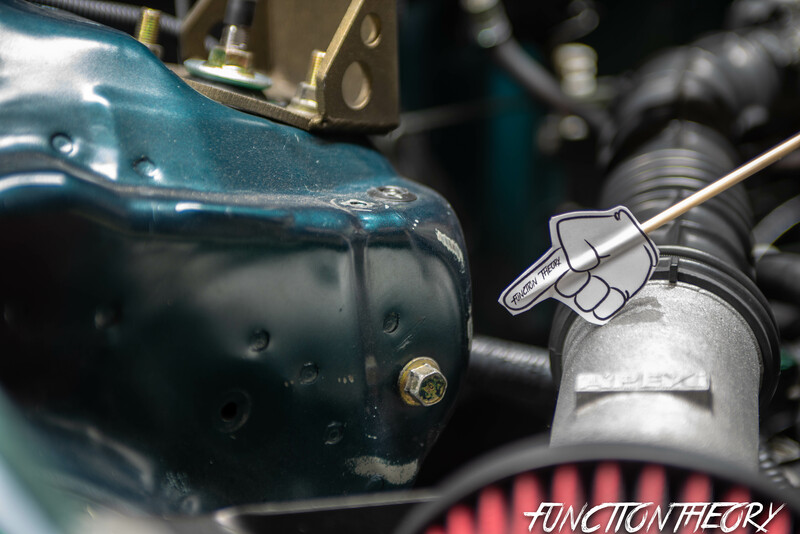 Your car will feel new again, just like the day the previous owner of you car drove the car off the lot. Hopefully you read it and you are all up to date on what has been done thus far to the car. As stated in the article everything was bad, worn out, blown, or just plain broken. As I went through the car rebuilding one piece at a time, I remembered that it’s the small things that add up to make the biggest difference. I had replaced the inner and outer tie rods ( just OE ones ) since they were literally the sloppiest tie rods I have ever seen, I literally can’t even comprehend how they got so bad. Maybe the previous owner lived in city where the streets were cobblestone? who knows. After replacing those amongst many other things, I drove the car like that for a few months. I Noticed one day that my passenger side seemed to have more negative camber than my driver’s side. 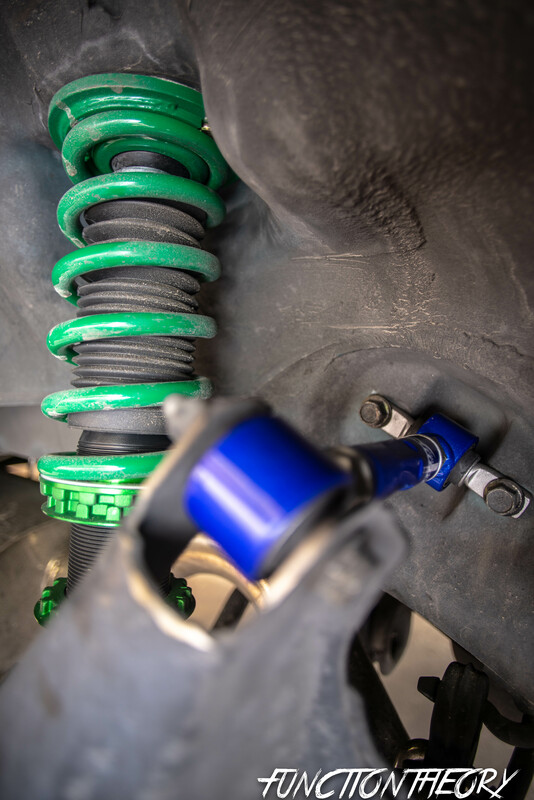 I know there are many things that can cause this, spring height, blown out ball joints, shocks, blown out bushings ( either in the lower control arms, upper control arms ), loose/bent sub frame, pushed back shock tower ( caused by an accident ) etc. you get the point there is a lot than can cause this. So I began by inspecting the lower control arms/sub frame making sure there is not excessive play, or loose bolts and everything checked out. I knew that the shock towers were square because I have a three point strut bar and all the holes line up perfectly. So next logical thing was that the springs had begun to sag, or maybe the suspension fork that slid onto the shock wasn’t fully seated. I took the wheels off and began to measure, check for loose bolts, or improperly seated forks. I see no major discrepancies… I then looked up a the upper arm, BOOM there is was. All my aggressive driving had caused the used junkyard upper arms bushings to blow out. You could literally see that the arm was not centered where it bolts in, rather it was pushed all the way forward rubbing on the pockets that it bolts into. This was causing the camber to be off since the bushings were disintegrated and the arms was effectively moved further in causing more negative camber. But this also was throwing off my caster, since the whole arm was moved forward the steering axis was now forward causing more negative caster on my passenger side. This was no good! 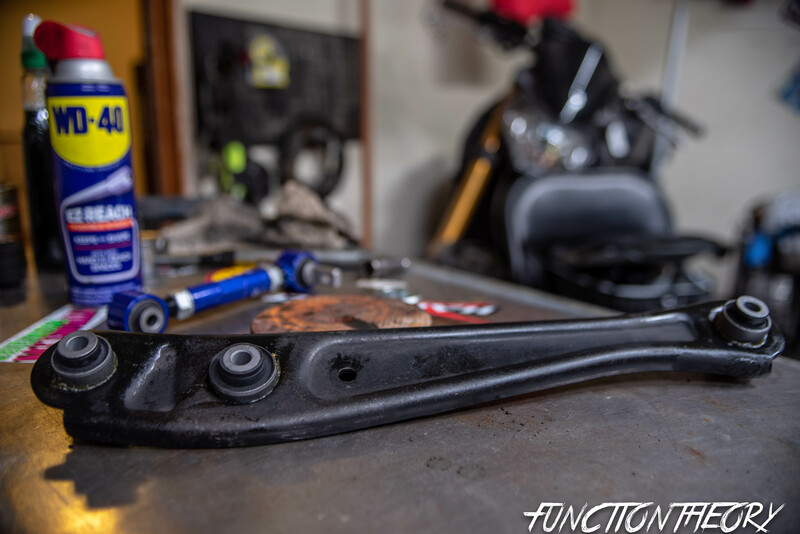 I actually made a temp fix by actually putting some wheel spacers off my motorcycle where the upper arm bolts in to help re center the upper arm. This was only a temporary fix, but immediately I could feel that the car felt more solid up front. The steering would return to center better when turning on to an intersecting road ( before it would almost feel like the car would just want to keep turning, and i would have to actually turn the wheel back to center.) you can see in the picture below how torn the and off center the bushing is. 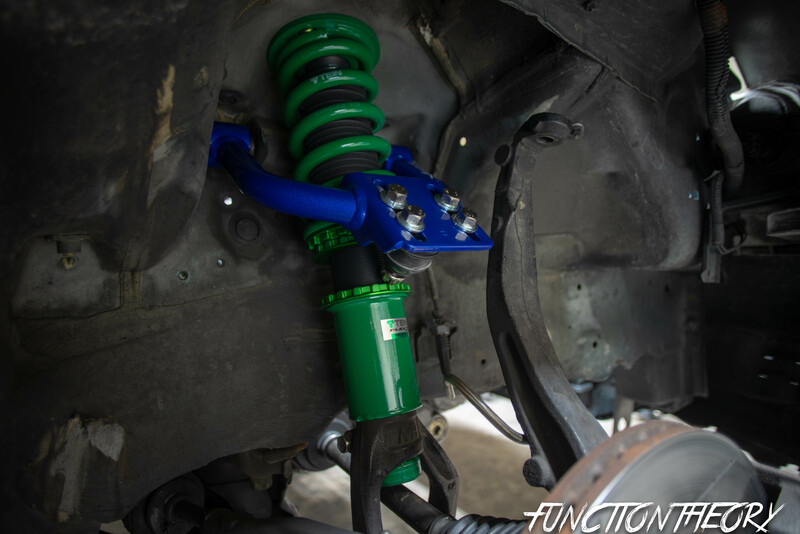 By now you know that I ended up purchasing Tein coilovers. 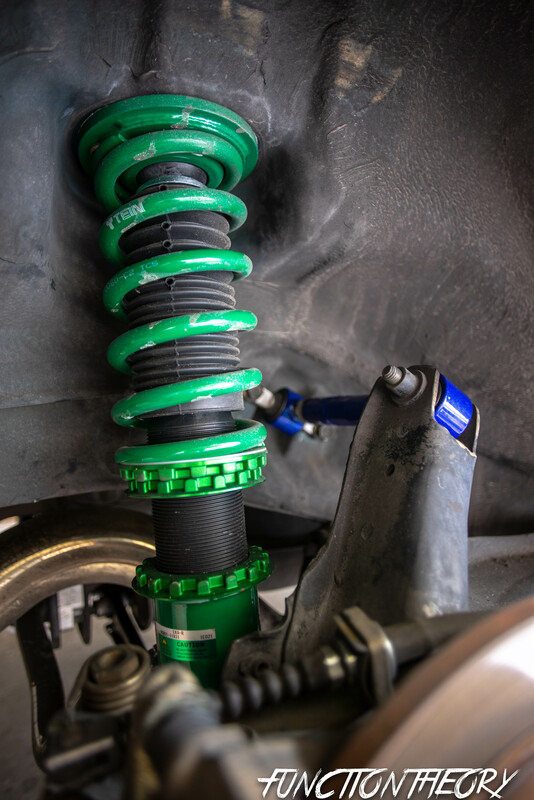 Since I felt my Koni Yellows were shot, and my eibach sport line springs just didn’t suit my needs any more. 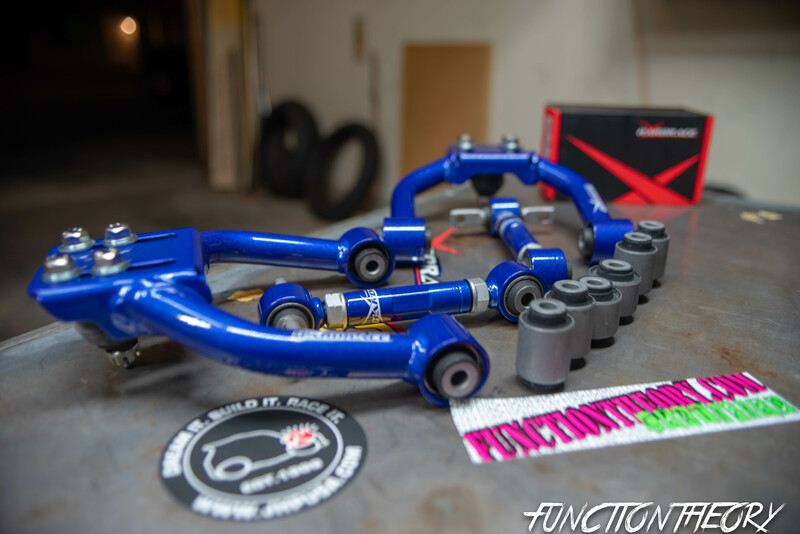 I also decided to purchase Hardrace front camber arms, rear camber arms, and rear lower control arm bushings. As this car was a daily and needs to stay as low key looking as possible I opted to save some money, and keep my bling level down by not buying aftermarket rear lower control arms but rather just press in new rubber bushings. since it was a daily I didn’t want pillow ball mounts, but just rubber bushings. 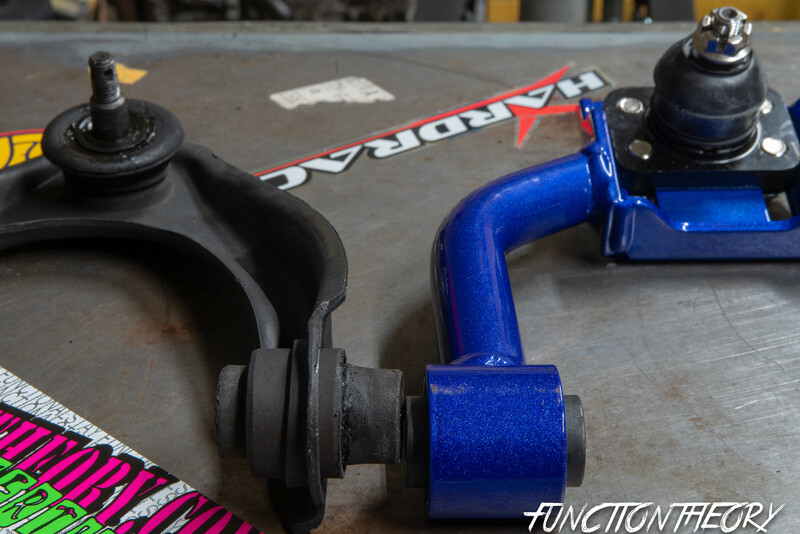 pillow ball mounts/bushings while increasing handling also increase harshness of ride, and over all road noise. After discussing with some reputable friends on which brand to buy, I ended up going with hard race. There are very many brands out there and each one having its pros and cons. Much like my review of the Tein Flex Z’s most companies are just rebranding Chinese products and calling it their own. Some brands even have a bad reputation, and when used in extreme conditions the product will fail. So Hardrace was the decision I went with, even though they have the bolts to adjust the camber “on top” of the arm which makes adjusting camber harder I figured I wasn’t going to be adjusting it more than once. 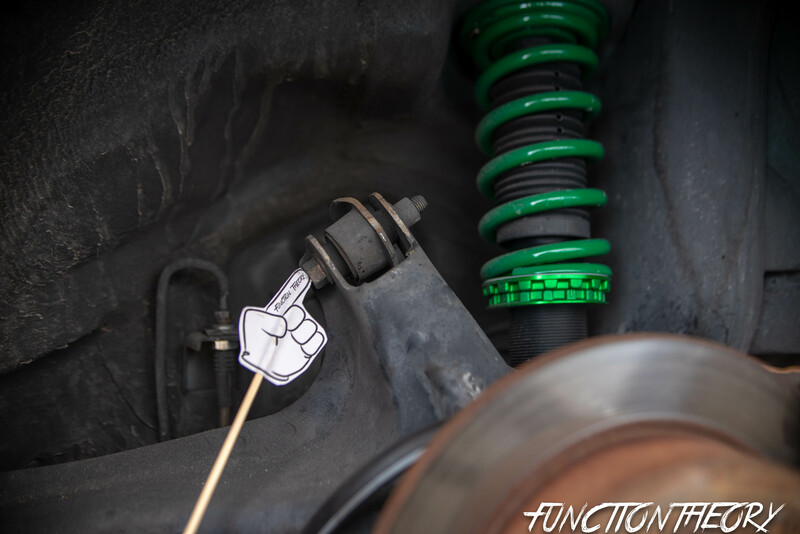 However my main concern was, Some people say when your car is too low the bolts used to adjust the camber will slam into the upper wheel well causing damage, or cracking of the top of the shock tower. Since I like my car to be a little on the lower side, and since I was running a softer spring on my coilovers I was a bit worried about this, but I figured that I could always just raise my car up a little. Let’s tally everything up. 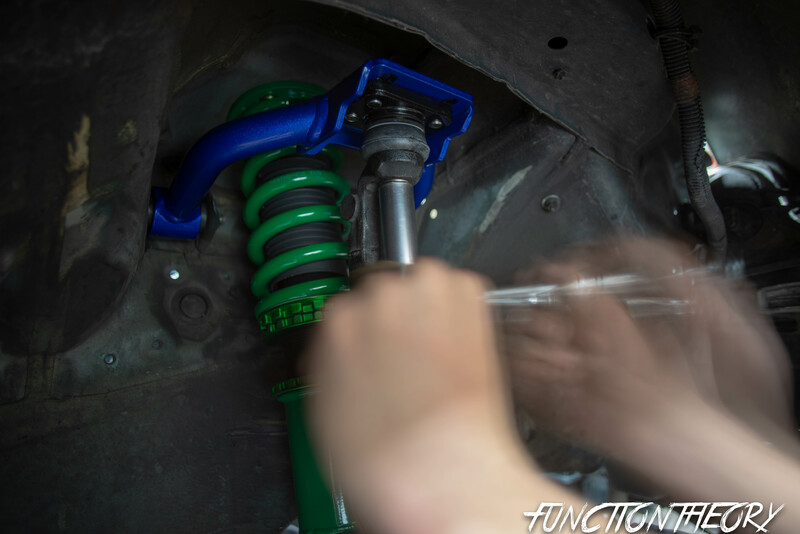 I now have new shocks, new upper strut mounts, new inner and outer tie rod, new front camber arms ( new rubber bushings and new ball joint ), new rear camber arms, and new rear lower control arm bushings. I’m on my way to having completely replaced every bushing, ball joint, and tie rod on the car. I’m extremely happy with the Hardrace products! Everything bolted on with ease, perfect fitment, paint seems to be durable, and very sturdy construction. Obviously I have yet to see how long they will last, and I will be doing a follow up after some time just to update everyone. 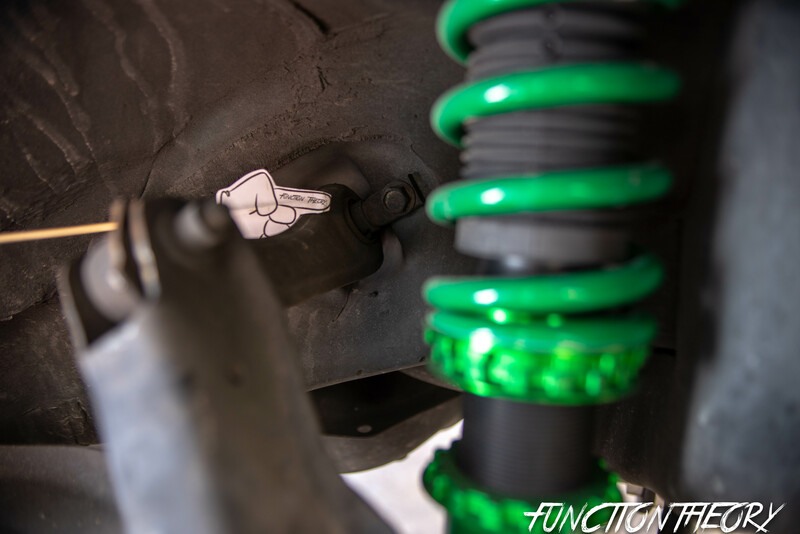 There is no squeaks or clunks, I even accidently bottomed out one side of my car pretty hard and no slippage in the camber bolts, or contact with the bolts and the shock tower. As soon as I drove the car I even was able to take a click out of the dampening on the Tein’s ( making them softer ). Now I know what you’re thinking… Of course they are going to feel better than the blown out 200k mile bushings and ball joints the were previously on the car. You are correct I’m sure any camber arm/ bushing upgrade would have made the car feel better, and the true “review” can’t written until some time has passed to see accurately how long the bushings and ball joints last. But for what it’s worth, my immediate reaction is these are great. They come packaged well, they look beefy, they make the car feel solid, no regrets with this purchase at all. Lucky for you guys there isn’t much to review, so I don’t have to drag out a long winded review. On to the install process. 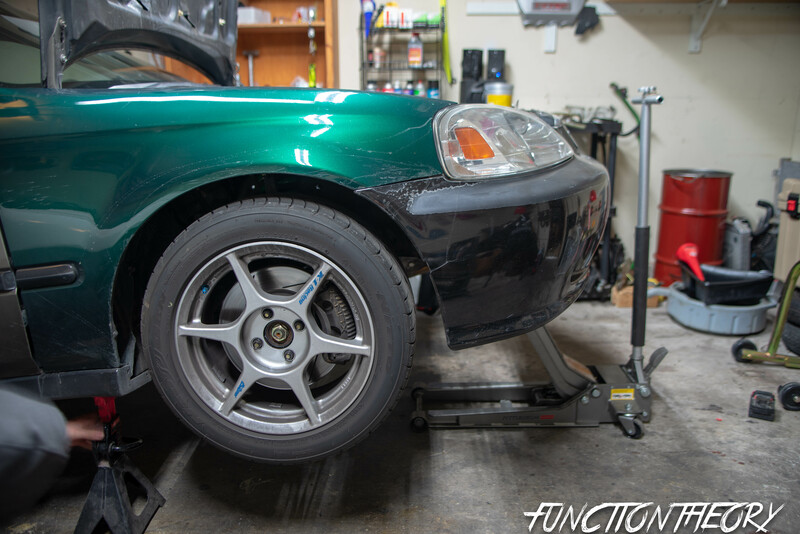 We will start with the front camber kit * note that this is for a EK which is a slightly different style compared to EG/DC chassis. But it’s pretty much the same process. Jack the car up, put on four jack stands, remove wheels and place them under car for that extra safety net in case cars falls off stands. I’m so happy Ever brought over his Milwaukee impact, it makes removing wheels super easy. 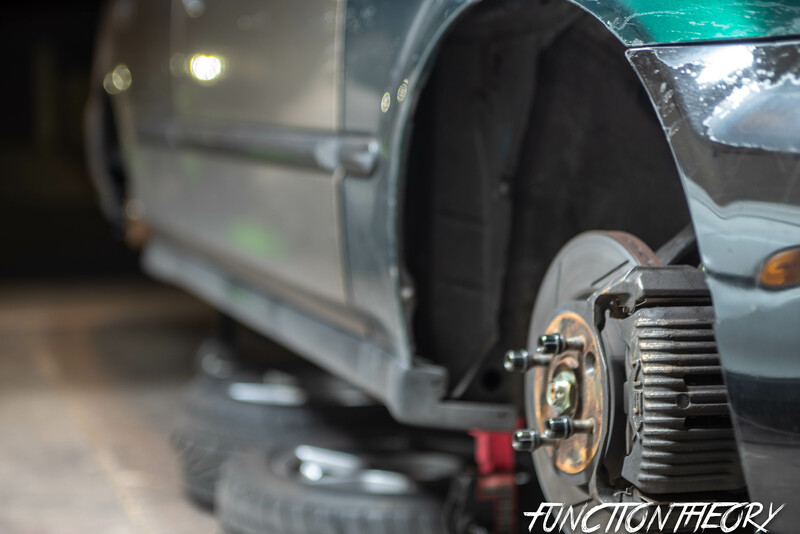 begin by removing the upper ball joint. remove the cotter pin, and castle nut. Then to get the ball joint undone I use a big hammer and hit the side of the spindle on the “nubs” that stick out a little on each side above the castle nut. feel free to hit this very hard. you may also need to do it repeatedly for some time before it lets go. * side note, if you were going to be reusing the ball join then you would want to leave the castle nut semi threaded on so while you are swinging away with the hammer you don’t hit the threads of the ball joint and damage the threads so you can no longer thread the castle nut back on. since we are replacing the ball joint I don’t care if I hit it or not. The arm should just come out now. Below is a good comparison of the Stock arm and the Hardrace one. As you can see in the pictures above. when the arm is in and the bolts are loose it will droop all the way down. Have someone lift it up while you tighten it. Then you can see how it will stay up once tightened. Then reattach the spindle to the ball joint, and slide the new cotter pin ( supplied with the new arms ) through. now your front is done. Now onto the rear camber kit. 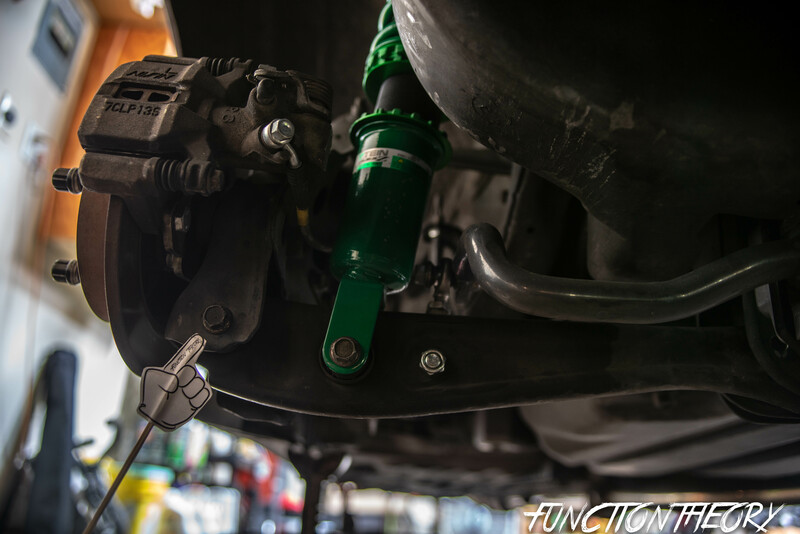 ( your car should already be jacked up at all four corners if not you will need to jack up the rear ) also this process is the same for all chassis. 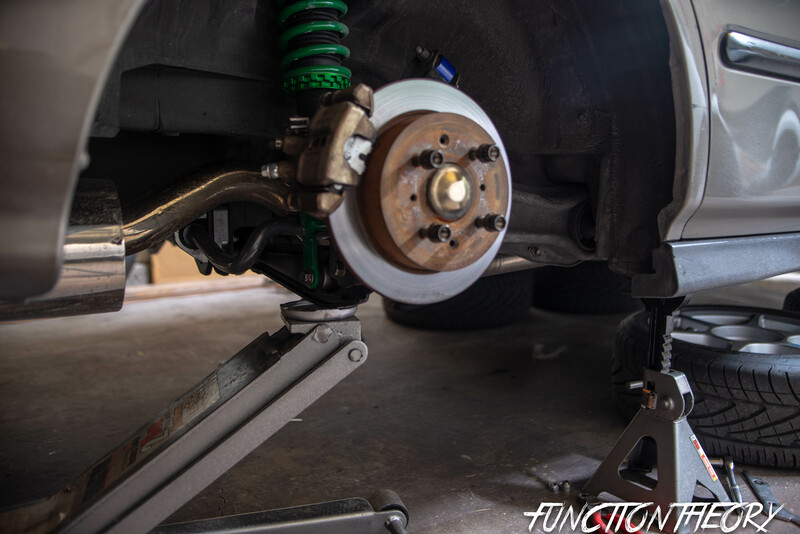 Adjust the camber kit so its as close to the same length as the OEM arm. Once again this will make it so youre alignment isn’t crazy so you can atleast drive the car. Install the new arm reinstalling the bolts ( 3 ) you removed to take the stock arm out. don’t tighten them just get them all started. 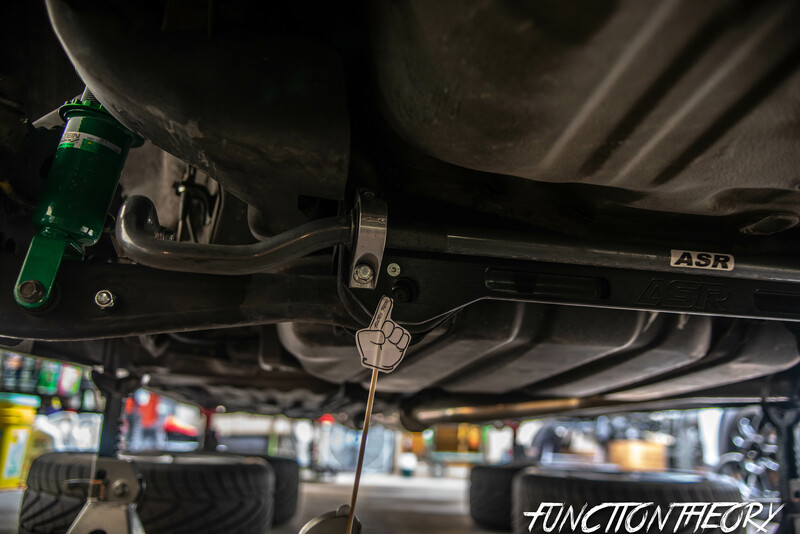 At this point I would tell you to use a jack and put it under the rear lower control arm and jack up the suspension so it would be as it is at ride height. ( I just jacked it up until the rear started coming off the rear jack stand.) now fully tighten all three bolts. Just like the front we don’t want any pre tension or any bind in the suspension when the car is sitting on the ground. BUT WAIT!!! 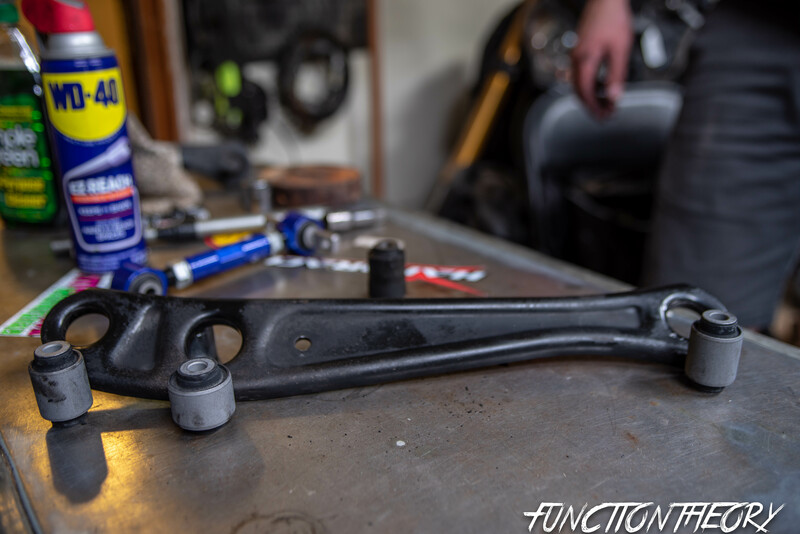 since we are doing the rear lower control arm bushings too, we aren’t even going to tighten the upper arms yet. however if you are only doing camber arms then at this point you would tighten them fully. 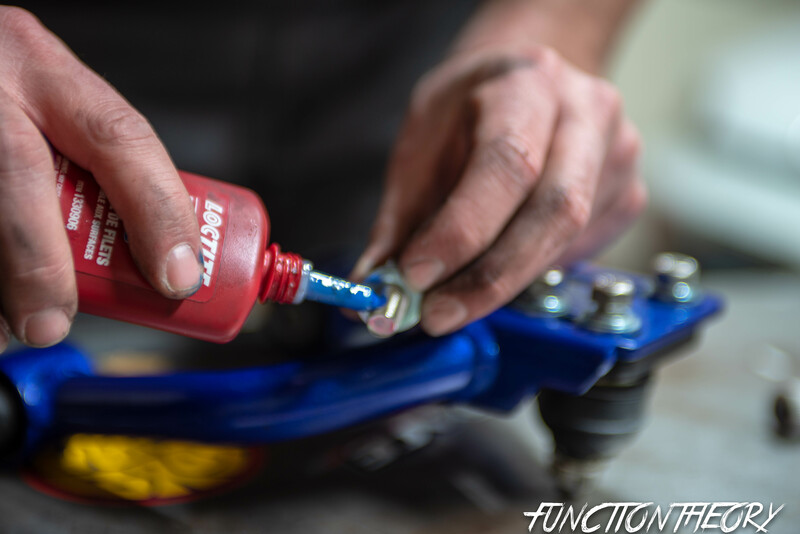 Lastly let’s do the rear lower control arm bushings. * even though the arms are different for each chassis the process is still the same. 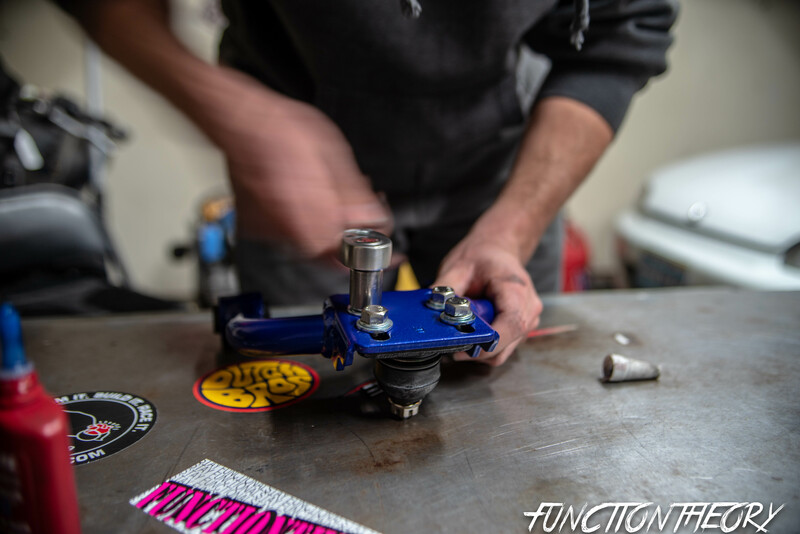 once the arm is removed, you will need to press out all the old bushings and re press in the new bushings. Having a press is probably the best thing. I’m sure you can MacGyver some other way to get them out and back in… But honestly a press is the best way. 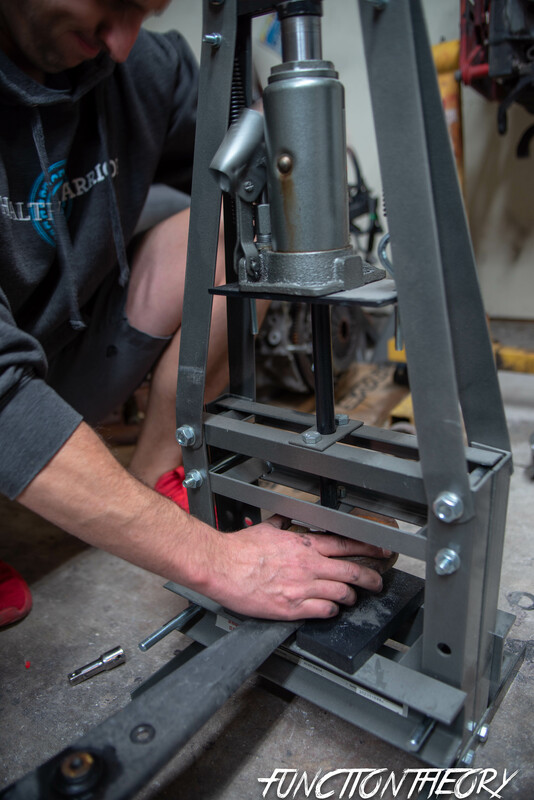 we aren’t even using a big press, just a table top style one that can be purchased at harbor freight. 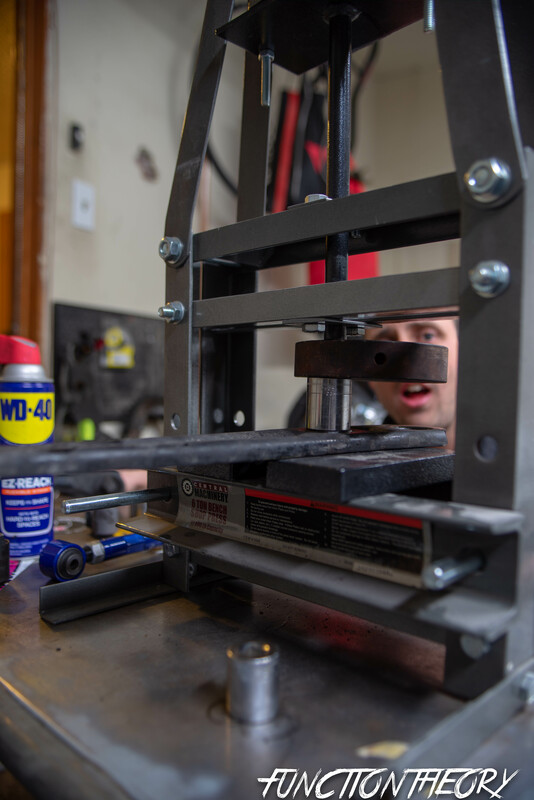 * pro tip use WD 40 to spray on the arms where the bushings go through the arm, let it sit for a few. this will help free up any stubborn bushings. Im sure some of you will be offended that i’m using sockets and the old bushings to press the bushings out/in. But whatever they are just junk sockets and everything went smoothly. here is the arm with all the bushings pressed out. 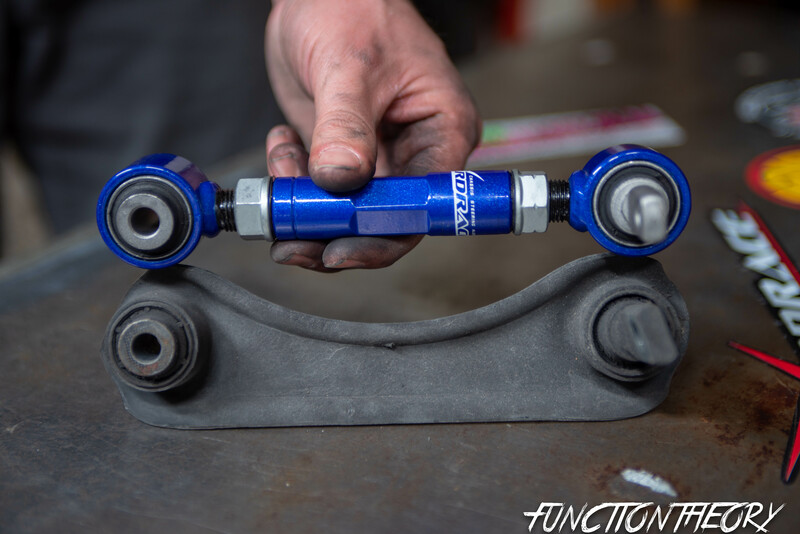 take note that there are two bushings that are one size and one bushing that is a different size. when pressing in the new bushings I used some grease to help it slide in easier. Below is the arm with all the new bushings pressed in. there is no actual measurement of how far to press each bushing in. we just made sure each bushing measured the same once pressed it. 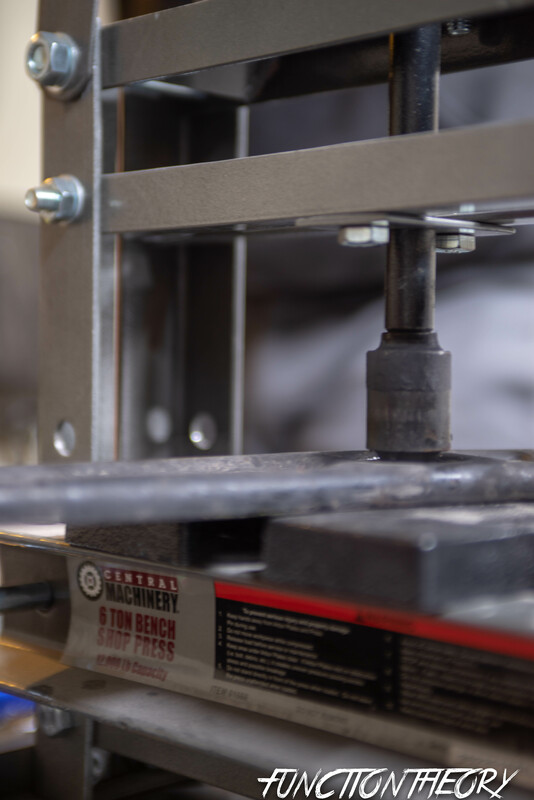 this means you will have press each one a few times to make sure it’s evenly centered in the arm. if not this will also cause binding in the rear suspension. but rest easy as it’s not as complicated as it sounds. 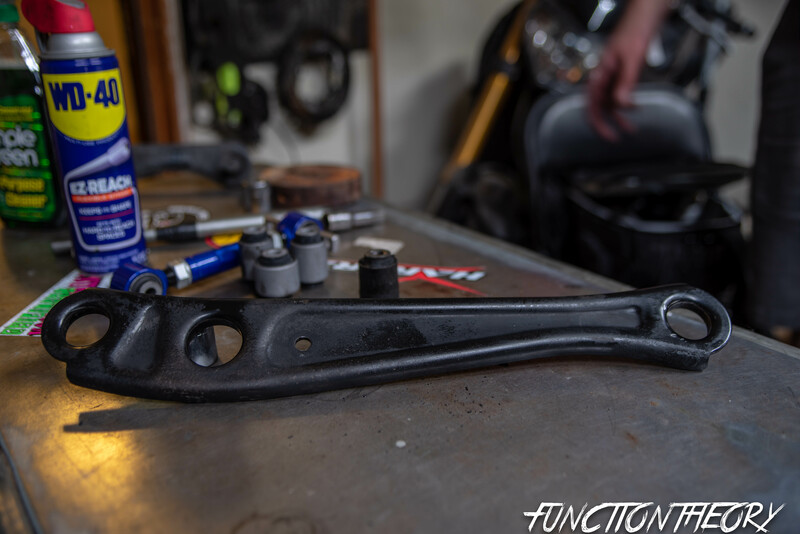 Re install the rear lower control arm with the three bolts ( 4 if you have a sway bar ) just get them all started before fully tightening. 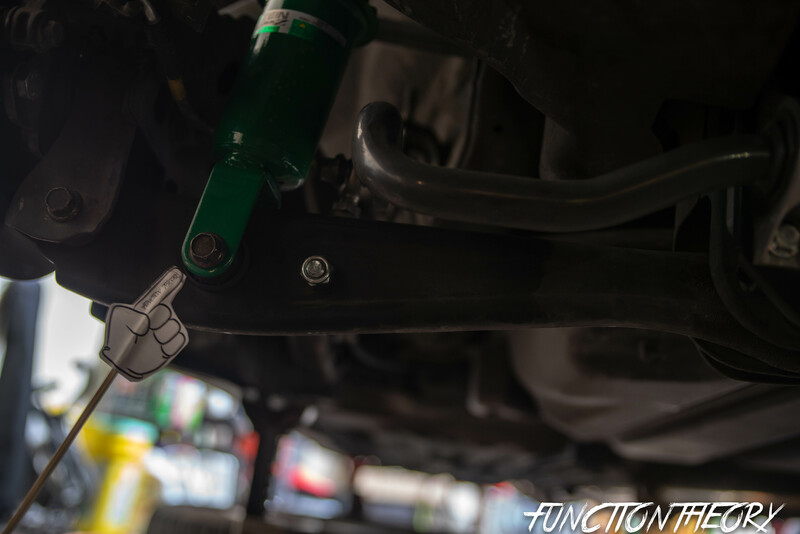 now use the jack trick to set the suspension to “ride height” to prevent preload, bind, and premature bushing ware. Once you have it jacked up go ahead and tighten the three upper arm bolts fully, and then the 4 ( since I have a sway bar ) lower ones fully and now you are all done with the rear. Overall Im beyond happy with how my car drives, handles, feels, reacts, and sorts all the bumps out. 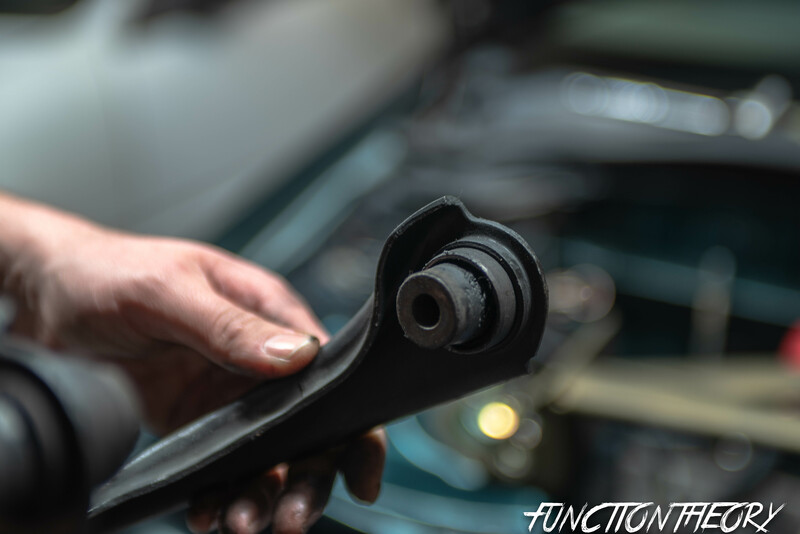 Anytime you replace an old worn out part with a new one its a given that it will improve youre car’s performance. 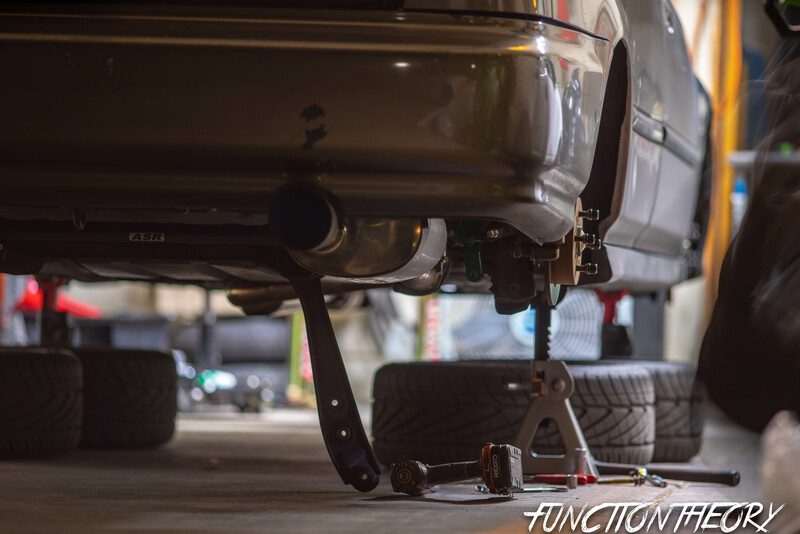 I would recommend doing all of these upgrades at once, seeing how you would technically want to get an alignment after each part you install. 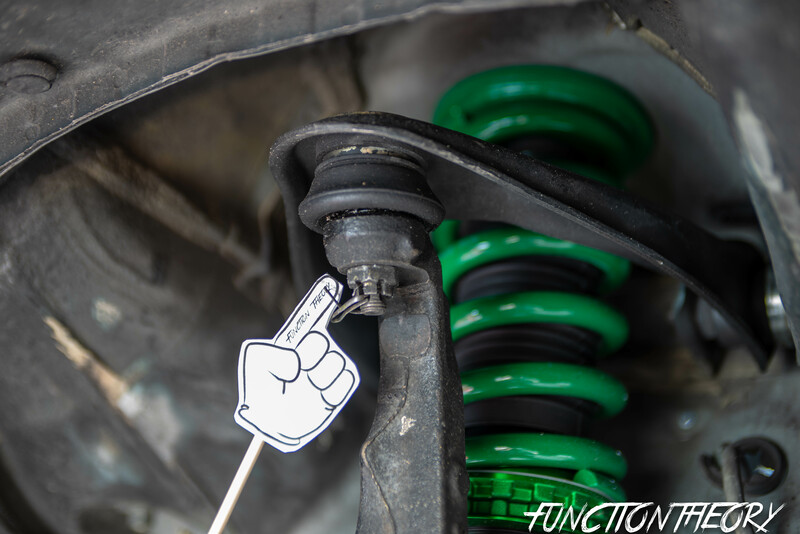 Anytime you remove, lossen, disassemble, or replace any part or your suspension you “technically” should do an alignment. so grouping all these together at once will help save you the cost of repeated alignments. In the past 3 weeks I have done new coilovers, new camber kits, new real lower control arm bushings, and I even did the PCI Rear Trailing Arm bushing too. ( the PCI RTA install and review will be coming up in a few weeks.) I honestly haven’t gotten an alignment yet since the PCI RTA bushings were on back order for a few weeks and I didnt want to get an alignment twice. I was just careful about measuring , and marking where my current alignment settings were at. I managed to get it close enough to be able to still drive, the steering wheel is off a little and there is a slight pull to the right. The car is my daily so doing modifications to it on my days off and having to make sure it’s all buttoned up so I can drive to work makes for a challenge to get things like alignments done, and makes extra pressure for me knowing that no matter what happens I need to get to work. PLease check back when the PCI RTA install and review is posted as i am beside myself with how much of a difference it made to my car. I have literally been telling everyone I know to get them for their cars.